Like many other herbal plants, henna has numerous medicinal properties. It can be used both as a cure for illnesses and for simple adornment for both men and women. The virtues and benefits of henna have been mentioned in several hadiths. Today, many people are only aware of the cosmetic uses of henna, such as colouring the hair, hands, or feet. 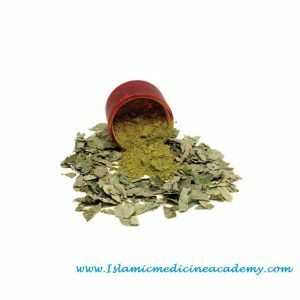 However, henna leaves have a great number of healing properties and can cure health problems like leprosy and eczema, and heal wounds, burns and ulcers. Henna is even known to have a positive effect on chickenpox and smallpox. Henna is most commonly used to colour the hands, feet, nails, and hair. However, it is only permissible for men to use henna to colour their hair—the application of henna to colour hands, feet and nails is only permissible for women. Men and women are permitted to dye their hair any colour except black. Henna is an excellent conditioner for your hair; it adds shine, strengthens it, and protects it from damage. Henna can also stimulate hair growth, decrease hair fall, and it is ideal for treating dandruff. 1. Applying henna powder or paste on to a burn will reduce the pain and speed up the healing process. 2. Henna powder or paste also possesses healing properties when applied to wounds and ulcers. 3. Applying henna to areas of your body which are aching will ease the pain. 4. If you are suffering from a sore throat, soak henna leaves in water for a while and then gargle the water. 5. Henna also has an anti-viral effect that can be used to cure warts and herpes simplex. 6. Henna is also known to have anti-haemorrhage properties. These remedies have been used for many years by our ancestors. Unfortunately, very few of us today know its pharmaceutical value. Henna is a miraculous flowering plant mentioned by the prophet (pbuh), so let us make maximum use of it insha Allah.